Non-food treats: Create a safe environment by handing out glow-sticks, stickers, toothbrushes, fancy pencil toppers, bookmarks and coloring books. Keep candy in a location only accessible to you. Consider giving away the candy or disposing of it after a few days. Inventory the Halloween treats for forbidden and safe treats; allow a few pieces on Halloween night. Give one piece of candy along with a healthy food such as fresh fruit or at the conclusion of a healthy lunch or dinner. Always brush your teeth after eating candy – perhaps there is a new toothbrush in your Halloween bag! This is a great opportunity to offer better-for-you Halloween treats parents and kids can enjoy together. Veggie and cheese kabobs – garnish serving tray with plastic spiders, bugs, and bats! Pick up mini Halloween candy bags and fill with home-made trail mix. Combine dried fruits such cranberries, apricots & raisins with granola and dark chocolate pieces. Invite your guests to make their own chocolate covered apples and dip in pecan pieces, coconut, or cereal. Bake quick breads such as zucchini and banana bread – add apples, pears or dried fruits for extra sweetness and nutrients. Incorporate seasonal fruits and vegetables such as pumpkin and apples. Pumpkin muffins, pumpkin pie, baked apples, apple cider are all popular choices. Party activity ideas: decorating pumpkins, dunking for apples, costume contest, pin the heart on the scarecrow, face painting and decorating cookies or cupcakes. Surprise your family with these dressed-up, spooky-looking snacks any time of year. Kids can help by spooning the pizza sauce on the English muffin and making the mummy face with the cheese and vegetables. 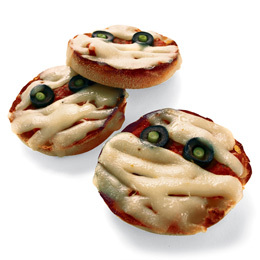 Heat the oven to 350 degrees F. For each mummy, spread a tablespoon pizza sauce onto half of an English muffin. Set olive slices in place for eyes and add round slice of scallion or bits of red or green pepper for pupils. Lay strips of cheese across the muffin for the mummy’s wrappings. Bake for about 10 minutes or until the cheese is melted and muffin is toasty.